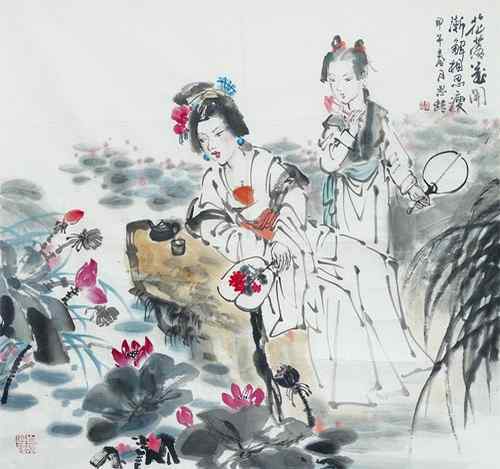 桃花庵裏桃花仙；A peach blossom lover lives in Peach Blossom Cot. 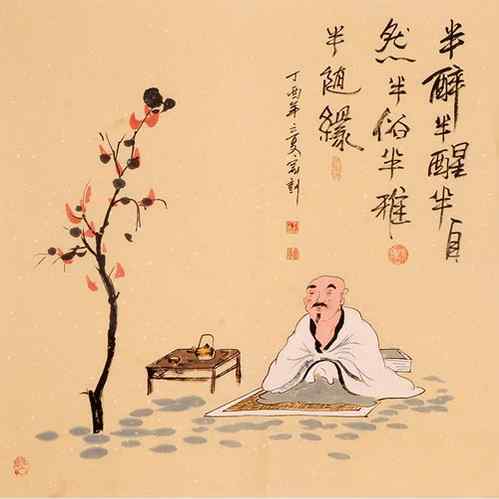 又摘桃花换酒钱。He sells his peach blossoms for money to buy wine. 酒醉还来花下眠；He would lie beneath them to spend his drunken hours. 花落花开年复年。The peach flowers blossom and fall from year to year. 不愿鞠躬车马前；Rather than bow before the steed and carriage fine. 酒盏花枝贫者缘。The poor only enjoy their cup of wine and flowers. 一在平地一在天；You'll find the one on earth, the other in the sky. 他得驱驰我得闲。The poor have leisure while the rich gallop with speed. 我笑他人看不穿；I laugh at them for those who can't see through are sad. 不见五陵豪杰墓，Can you find where the tombs of gallant heroes stand? 无花无酒锄作田。Without flowers or wine they turn into ploughland.